Cut the brown sides of bread and cut diagonally into 2 triangles. Deep fry or shallow fry bread slices in ghee till it becomes crispy and light brown in colour. Keep it aside. In same ghee roast nuts and keep it aside. Take a pan and heat milk. Add sugar and let it come to a boil. In another bowl, take custard powder, saffron and 3 tablespoon of milk and mix it well. If you are adding mawa/khoya then slightly mix it in milk and add it. Add this to the milk and stir continuously to avoid lumps. Boil it till it thickens. Let it cool completely and chill it in refrigerator or serve it warm. 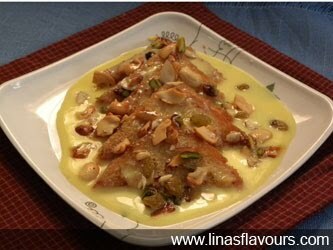 To serve: Take a plate or bowl, put fried bread slices, pour milk on it and garnish it with nuts and serve.